The FAA has published new guidance today on overflight risk for Iran, and the Tehran FIR (OIIX). The relationship between the US and Iran has soured in the past twelve months, since the last KICZ Notam and guidance was published. In May, when President Trump announced the withdrawal from the Nuclear deal, the Iranian parliament burned the US flag and shouted “Death to America”. Without seeming alarmist, this relationship must be taken into account when planning flights through the Tehran FIR. Although the reopening of Iraqi airspace in November last year has provided additional routing options, our recent article London – Dubai, which way is best? 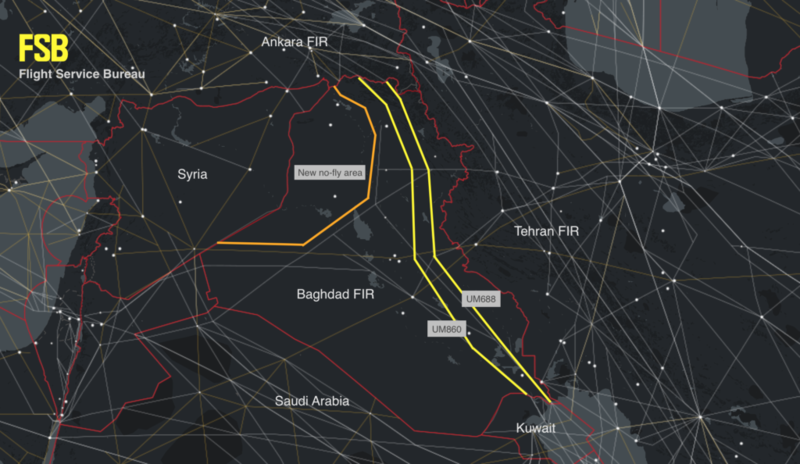 shows that there is no perfect route in the region, and operators must consider their preference for Iraq vs Iran. A new Notam for Iran, KICZ 16/2018 was published today, and contains new wording, rather than being an extension of the previous. The key message of the Notam is : “Exercise caution when flying into the Tehran FIR“. We would add that if planning an overflight of the Tehran FIR, consider the risk from an unplanned landing – decompression, medical, engine fire – which may force you into Tehran or another airport – it’s a big chunk of airspace. The US State Dept currently advises: Do not travel to Iran due to the risk of arbitrary arrest and detention of U.S. citizens. As always, we’d like to hear your thoughts and comments on this new information, overflying Iran, and Middle East risk in general. Comment below, or mail our team at comments@ops.group.